Dehumidifiers are ideal solutions to help control reoccurring mould infestations in particularly moist areas. There are many factors that contribute to mould growth, but one of the main culprits is excessive moisture being present. All types of mould require moisture for it to thrive, so by limiting the moisture in your home, you can effectively help prevent and eliminate mould infestations. This when a dehumidifier can help; they are machines that reduces the level of humidity in the air, and therefore keeps the RH (Relative Humidity) at a reasonable level. A dehumidifier is a household appliance that reduces moisture from the air. They come in different shapes, sizes and capacities; suitability will often depend on the severity of the humidity and the size of your home and/or area you wish to reduce moisture from. To help eliminate condensation e.g. condensation on windows/glasses or fog/vapour on glass are commonly signs that there is too much moisture in the room. Here’s a range of recommended dehumidifiers, suitable for small to larger spaces. Please note, we do our best to keep all the information as accurate and updated as possible. However, some times details may not get updated immediately, so prices may differ from what we have listed (e.g. special discount offers). Most dehumidifiers will include how much noise they make in the spec. While all dehumidifier do differ, a low setting on a dehumidifier is typically as loud as a person whispering or approx 35dB. A high setting can be compared to a desk top fan operating at full speed, which of course, can be considerably noticeable, and that’s why it’s always advised to get one which allows for different settings. This is probably what most consumers will be concerned about- how effective the appliance is at removing moisture from the air. The extraction rate is the maximum amount of moisture that the dehumidifier can extract with in 24 hours of running. The rates are typically from 8 to 14 litres, but of course, that will depend on the specific model. The more expensive/powerful dehumidifiers generally have a higher extraction rate. Take a look at the spec of each model to determine how effective it is. A humidistat works much like “climate control”, it measures the relative humidity in the room, and it keeps it at a pre-set level, and some even have the capability of turning the dehumidifier on and off when certain levels are reached. This feature can save on running costs, so it’s recommended to find a model which has it available. The drainage tank is where all the extracted moisture from the air will end up. For domestic dehumidifiers in the UK, the typical tank size is 1.5 litres – 2 litres. The bigger the tank, the less frequently you will have to empty it. Generally, the more powerful dehumidifiers will come with bigger tanks, as they’re able to extract more moisture from the air. We recommend that you buy an dehumidifier that either automatically stops working when the tank is full, so there are no spillages or small floods, or one that allows you to attach a hose, which enables the collected water to flow into a low-level drain. It’s also useful to get one where the tank can be easily removed to avoid water spillages. Most of the higher-end dehumidifiers will come with a timer, which allows you to programme a start and off time, which is particularly useful if you only want it to run for certain periods, it can also help save electricity. Check the spec of the dehumidifier to ensure it’s an available feature if that’s something you will need. How much does a dehumidifier cost to buy? Dehumidifiers drastically vary in sizes, and most importantly capacity, and that’s typically why they vary in price. Essentially, the higher end models are more powerful and they will be able to reduce moisture from larger areas at a quicker rate. What size dehumidifier is most suitable for you? Dehumidifier capacities typically range from 0.5 litres to 20 litres, this is a measurement of how much water the tank can hold. The most suitable size depends on the size of the space you want to use the dehumidifier in. For example (and generally speaking), the smaller capacity tanks are more suited towards small rooms, like bathrooms. If you want a dehumidifier to control the moisture for larger areas (even entire houses), then dehumidifiers with large tanks will be more suitable. Most dehumidifiers will specify their tank size and what size spaces/houses they’re suitable for. They aren’t really that expensive to run, and it will mostly depend on how much power the dehumidifier you’re using requires to run. The average running cost is somewhere in the range of 3p – 8p per hour. It’s worth noting that it will cost more to run models that extract more water because they generally have higher power consumption. So you will effectively pay for what you get. How noisy is a dehumidifier? This is a major concern for many homeowners as dehumidifiers are notoriously noisy, and they can disturb sleep if they’re running through the night while in close proximity to bedrooms. Fortunately, as technology has evolved, dehumidifiers are getting quieter (meaning more bearable). Also, most dehumidifiers have power settings, such as low, medium and high. The lower settings generally make less noise. When set to low, some are as quiet as a person whispering. If you need a dehumidifier running 24 hours a day, you could reduce the level during the night, and increase power during the day. 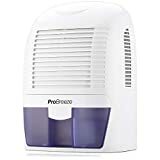 Where should I put my dehumidifier in the house? The preferred position of the dehumidifier will mostly depend on circumstance. If you’re trying to reduce moisture in a single room, the appliance should be placed at least 6-8 inches out from a wall so that air flow is not compromised. If you’re trying to reduce moisture in an entire house, it’s best left in a main hall way, which connects to several rooms. For particularly larger properties, it might be worth investing in a couple of dehumidifiers. For properties with multiple floors, you may need to move the appliance between floors, unless you buy multiple machines. It’s not advisable to use a dehumidifier in a bathroom due to electrical safety risks. However, the great thing about a dehumidifier is that it’s not room specific. It will deal with moisture problems in a bathroom if used on a landing or adjoining room. When you’re looking into purchase a dehumidifier, you may notice the choice between a mechanical and desiccant. It’s important to know the difference between the types as it may determine which is more suitable for your purposes. A desiccant dehumidifier uses a desiccative, which is a drying substance, to remove moisture from the air. They’re generally considered more environmentally friendly as they do not use compressors to function, which also make them cheaper to run. They are generally cheaper to purchase too. Desiccant dehumidifiers are best used in high humidity and low temperature areas e.g. in the UK. They can work from temperatures from 0 degrees C.
Mechanical Dehumidifiers are a lot more common than desiccant models. They work similarly to air conditioning units, but they raise the air temperature as opposed to cooling it. They’re similar in the sense that they pass through air through hot/cold coils. Mechanical Dehumidifiers use compressors, which means it emits greenhouse gases, which makes it the less environmentally friendly option. They work well in conditions with temperatures over 5 degrees C, and may fail to work properly if temperatures are below. Mechanical dehumidifiers are ideal for moderate to high humidity areas (70% and plus relative humidity). It’s important to note that at approximately temperatures of 15 degrees C the average mechanical dehumidifier is more expensive to run than a desiccant dehumidifier. They actually get cheaper to run the higher the outside air temperature is.